Spring has finally sprung and everyone seems to be shedding layers (hooray for dresses without tights!) and already spending more time outside. And while many of us are grateful that the cold, blustery days seem to be behind us, your skin may not have gotten the memo yet. Often, to respond to the harsh weather associated with an East Coast winter, my clients add richer and heavier products to their routine. This is something I definitely recommend, as it adds an extra barrier of protection. However, the issue is that Springtime slowly sneaks up on us and many of my clients forget to change their skincare routines. I like to remind them that it is essential to assess your routine seasonally in order to properly care for your skin. I am proud to announce that I am introducing a new line of products to ceciliawongskincare.com called Alchimie Forever! After thoroughly testing Alchimie Forever’s products personally at home, then using them in the treatment room and receiving rave reviews from clients, I have decided to sell some of my favorite products from the line on my website. I feel that they perfectly compliment my namesake skincare line. As someone who has worked hard to formulate my own products that are all natural, cruelty free, and actually work, it takes a lot to convince me of other so-called “natural” skin care companies’ brand integrity. Having tried many of them myself, I have found that all too often they claim to be cleaner than they actually are and promise results that never appear. That’s why when I was introduced to Alchimie Forever, I knew that they were different. As no strangers to clinical studies to prove the efficacy of their products, the brand is at once, both clinical and natural. Most importantly, like Cecilia Wong Skincare, Alchimie Forever is results driven and never offers false promises. 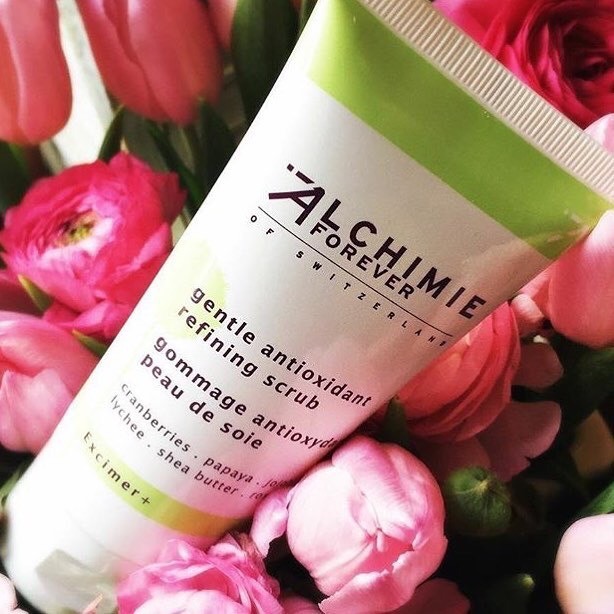 Today, I wanted to focus on one of my favorite products from the line, Alchimie Forever’s Gentle Refining Scrub. This silky scrub leaves the skin soft and glowing. 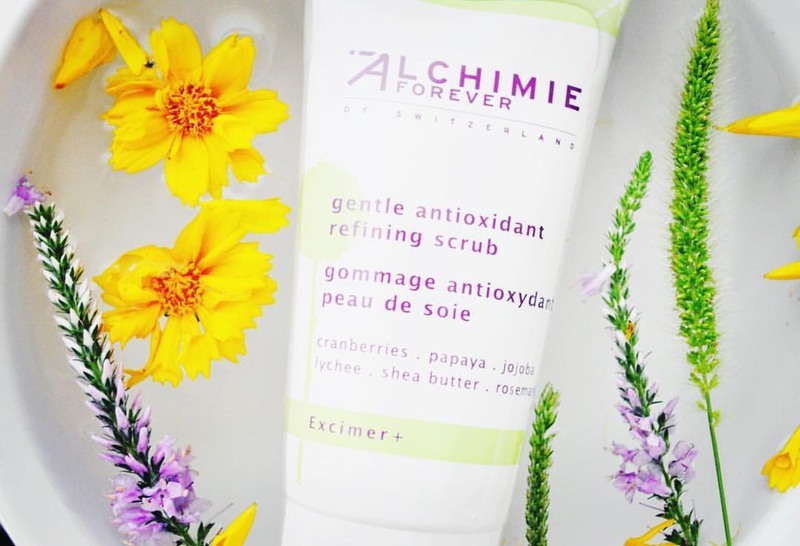 In the past, I’ve discussed the difference between physical and chemical exfoliation and what I love about this scrub is that the cranberry beads, jojoba pearls, and papaya enzyme in this product effectively (yet gently) exfoliate the skin, both physically and chemically via fruit enzymes. Simultaneously, shea butter nourishes, while natural antioxidants derived from lychee and rosemary protect the skin against environmental stress. And of course, this scrub does not contain microbeads. Over the long winter, you accumulate dead skin cells, which make your skin appear dull. By sloughing off those old skin cells, you’ll reveal the new layer of skin beneath it along with a brighter, more radiant complexion. I’ve discussed the importance of good circulation in the past, but I cannot stress it enough. Giving your face a gentle scrub will help to increase the blood flow, in turn helping increase cell turnover, which means your skin will regenerate and heal quicker. Exfoliating helps to remove dirt and oil that clog pores and lead to breakouts. By exfoliating, you are deep-cleaning the pores, thereby removing the impurities and lessening the likelihood of a breakout. The Gentle Refining Scrub only needs to be used once to twice a week, as it is super effective. I love that this product can be used in two totally different ways: as a scrub and as a mask. To use as a scrub, simply massage gently in a circular motion over dry skin for an exfoliating effect. Rinse thoroughly with lukewarm water. To use as a mask, apply to dry skin and leave on for up to five minutes. This allows the fruit enzymes in the scrub to really get to work. After the allotted amount of time, rinse thoroughly with lukewarm water. Regardless, of the method you use, I recommend using my Black Currant Serum post-scrub to lock in moisture and leave your skin bright and glowing. What do you think about changing your skincare routine seasonally? Have you noticed that your skin changes with the weather? Let me know if you try adding a scrub to your skincare routine and how it makes your skin glow like never before! I would like to thank you so much for reading and so generously sharing! It’s always delightful sharing these excellent tips with you all!